As part of the 2015 European Heritage Days, the French Huffington Post invited the team of the BnF’s digital library Gallica to become a one-day community manager. For this occasion, several “Gallicanautes” (these intensive users of Gallica sharing their finds online) were invited to publish an article about a document of their choice. 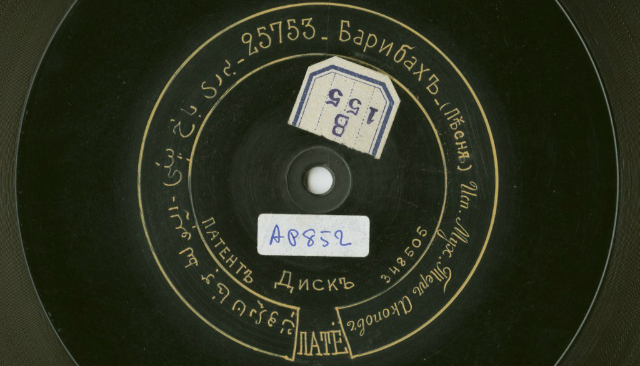 I chose to write about sound heritage and selected a piece of Azeri folk music made in 1911 by Pathé recording engineer Thomas John Theobald Noble. The song called “Bari Bakh” is performed by singer and târ player Moukhan Teur Akopov. I must say I’m pretty fascinated by this series of recordings made in Caucasia and Central Asia by Pathé in the early 1910s. First of all, the records are absolutely scarce and the only known copies belong to the BnF. Furthermore, besides the records themselves and the account of Noble’s journey published in 1913 in the Talking Machine World magazine, there are nearly no information about them. Here is the link to my article (in French). The recording is available directly on the Gallica’s website.